Oxygen enters your lungs from the air you breathe; the body needs oxygen in order to respire. The heart pumps blood to the lungs. Here it picks up up oxygen and excretes carbon dioxide. The oxygenated blood is taken to the heart and pumped all around the body. Oxygen, glucose and other nutrients pass from the blood into the cells for respiration. Carbon dioxide and other waste products pass back into the blood. This deoxygenated blood then travels back to the heart and is pumped to the lungs where the whole process starts again. When you exercise the muscle cells are respiring hard to provide enough energy for that movement, so they need lots of oxygen and glucose. To supply the cells, your heart pumps faster and harder in order to circulate the blood with the glucose and oxygen around the body more quickly. Therefore, you breathe more quickly and deeply. 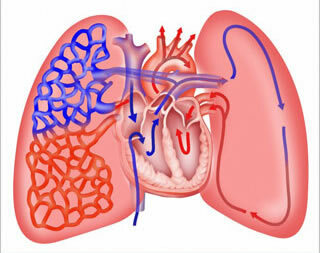 The right side of the heart pumps blood to your lungs, for the blood to collect oxygen. The left side of the heart pumps the oxygen rich blood out around the body. Arteries transport blood away from the heart. The fresh blood is full of oxygen. 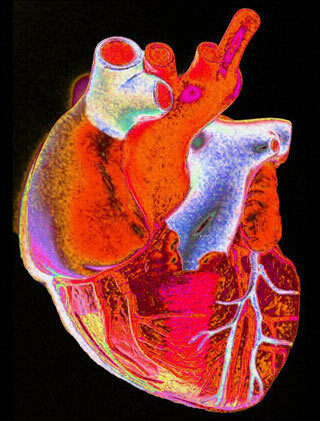 Veins transport blood back towards the heart. This stale blood has less oxygen. Capillaries are tiny blood vessels which connect arteries and veins and transport blood to the body’s organs. When resting, the adult human heart beats at about 70 bpm (males) and 75 bpm (females)The resting pulse of an athlete is usually less than 70 beats per minuteThe blood leaves the heart to collect oxygen from the lungs and glucose from the digestive system to transport around the body. After delivering the oxygen to the cells it collects up carbon dioxide and transports carbon dioxide back to the lungs where it is removed from the body when we exhale. Oxygen entering the lungs of a healthy body. The Right side of the heart pumping blood to the lungs to collect oxygen. Stale blood being transported by the veins back towards the heart. Oxygen filling the alveoli and then passing into blood vessels, which carry the oxygen to other cells around the body.